We recently developed a new advertisement that supported our business mission and efforts. This focused more on what we do rather than the usual what the customer might be seeking. In this we hope that this translates into other businesses that have a similar mission and can benefit from our experience and endeavors. We hope this generates sales in both alpacas and products especially with regard to using black fleece. This is more about branding our business. When discussing lingering fleece qualities I would like us to focus on AFD and SD only but certainly could staple length or fleece weight. Recently I was challenged by a well known and experienced person why worry about lingering fleece qualities. The reasoning was due to keeping older genetics rather than cycling them out for more improved genetics. I am certain there are many more reasons but that was my take away. My answer was reduction in cost was the primary reason there is an appreciation for lingering fleece qualities. Based upon our cost structure I put together a thought experiment to prove the point. 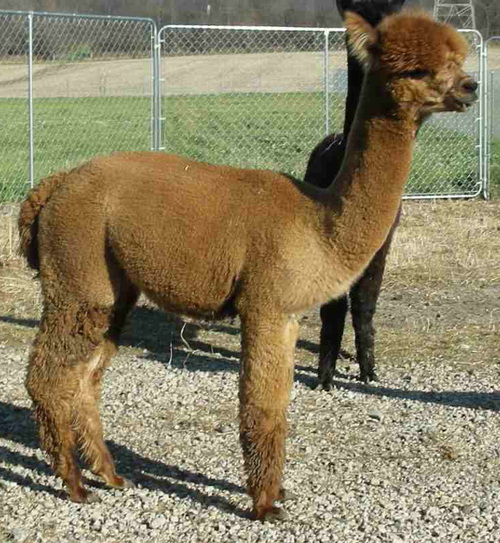 Over 12 years holding an alpaca that expresses lingering fleece qualities cost $5,356.00. 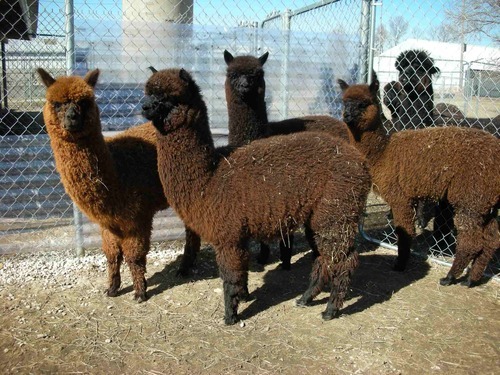 Over 12 years replacing an alpaca every five years cost $7,293.00. Breeding fee reduction to match cost between both scenarios would be $1,000.00. The net difference: $1,937.00. Does this make the case for lingering fleece qualities? We are shearing approximately 68 alpacas. We employ the Noodling method and work with a professional shearer Brent Winslow utilizing the two stage shearing method as well. This is the time to experience husbandry in one day with nail trimming, shearing, CD&T inoculations, and fleece assessments. Haltering and leading alpacas at its best. You are welcome to watch or help. We simply request if you would like to attend even if you stop by for only 20 minutes to let us know at least two weeks in advance so that we can anticipate the number of folks who will be here for the day. We hope to see you then and happy we can provide the opportunity. We may even hand you a lead or to to hang onto. The Gals ready for shearing. Let's start with micron. Think of micron as a ruler. A ruler is divided into lengths 1/8, 1/4, 1/2, 3/4, 1 inch so you can measure different lengths. Micron is the measurement of thickness like you would measure the diameter of a circle. When applied to alpaca fiber it is the measure of the thickness of fiber but when reported it is the average thickness of many fibers in a sample. Relative to humans, most cannot distinguish variation under 3 micron with the eye or feel but generally can distinguish prickle over 25 micron. The lower the micron of a fleece the smaller diameter of the fibers and the less prickle and more comfort next to the skin. So when we talk about micron average what is the range of the sample or put differently how many fibers were thicker than the average and how many were thinner than average. That is where SD comes in. This is a statement of variability of the sample of the fleece. IF SD is 4 and the average micron (AFD) is 22 this tells you that half the fibers below the average were between 18 and 22 micron and half the fibers above the average were 22-26 micron. So what SD is telling you is how close to the average is the sample. CV is calculated by dividing SD by AFD. So in our example CV has little bearing or by itself little relevance. 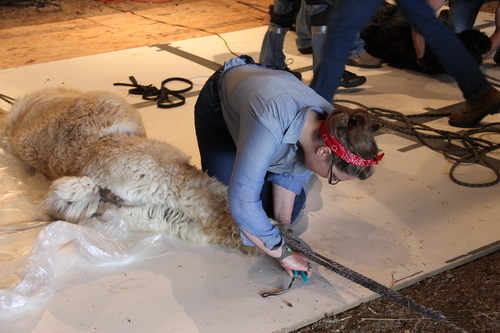 Where CV comes in handy is when you have a bale of fleece from many alpacas and you want to determine how closely related they are to each other in the bale. It has some relevance if samples were taken from multiple sites on an alpaca called a grid sample. The reason CV can be misleading is simple and best understood by example. If I tell you CV is 20 but nothing more this may sound good but lets see what happens using AFD and SD. If we have AFD 20 an SD 4 or AFD 30 and SD 6 both these provide a CV of 20. 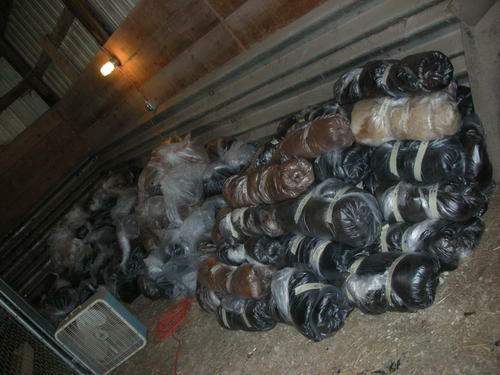 Two very different fleeces and very different end uses for each fleece. One last point to make regarding AFD, SD, and CV. A single fleece can vary. If you pull the sample from the 3rd rib and down about 5 inches (roughly midside) you may get a much different reading if your sample were taken 12 inches down rather than 5 inches. This variation can be as much as we saw in the discussion of CV which is one reason a grid sample is more revealing than a single pull sample. Wednesday’s weather prediction for Friday our travel day to the show, was rain, sleet, snow, freezing rain, and high winds – not the weather we look forward to hauling alpacas in a trailer. MAE emailed a notice Wednesday that they prepared the facility to accept alpacas Thursday for early arrival to avoid the weather. Marge was able to rearrange her schedule, as I scrambled to get the show supplies ready to go and we met somewhere in the middle when Marge called and said she could be home at 11am Thursday. The car was loaded when she arrived at 11am and by 1:00pm the alpacas were loaded and we drove out the driveway to MAE anticipating an arrival at around 6:00pm and maybe have time to go to dinner with Rob Stephens of Robasia who offered to help setup seeing he had already arrived and was set. We were on the road for 3 hours and were halfway between Sparta, Wisconsin and New Salem, Wisconsin making good time and experiencing good weather when I noticed a new light on the dashboard - battery low. How, it’s a new battery! Yup battery nearly dead and not charging. Then another light popped saying ‘Check gauges’. Thought I just did! Battery nearly dead but wait the water temp is pegged hot so we immediately pulled off onto the shoulder. By this point I was pretty certain what was wrong and checking confirmed my concern – the serpentine belt was wrapped around the fan shaft. My experience with breakdowns in the middle of nowhere is that I usually have no reference where I am or how to tell the person where to find us, but luck was with us and 10 feet ahead was mile marker 18. Ian knew right where that was and stated, “There’s nothing there!” We answered smiling that it was a beautiful farm valley with some nice looking farms and he agreed. Ian was off on his arrival time. He pulled up in 15 minutes stating we couldn’t let the alpacas sit right? This started people stepping up to help others in distress and responding to the need to take care of alpacas. The GM dealer according to Cory was open till 8:00pm being their one late night in their service area. He told us where we could drop the trailer and wanted to make certain it was an area where the alpacas would not be disturbed with a lot of noise. The problem was Ian had driven in too far into the lot and needed to back up our car and trailer while in tow. Having tried backing up the trailer 50 feet that morning I got a real sinking feeling as I remember that difficulty of snaking back and forth. Well I didn’t know Ian’s skill and he just backed up the 100 feet without drifting one way or another. I need to take lessons from Ian! Cory then called the serviceman Tim into the office and asked if he would drop everything and get right on our problem because we had alpacas in the trailer and needed to get to Owatonna by 9pm? It turned out Tim was the only service person working because one was sick and absent and the others wife was delivering their first child that day. Tim was working on three other cars with people sitting in the waiting room. I thought this guy is going to blow but he said “Sure”. Cory explained how lucky we were that it was Tim on duty because Tim is one of those who thrives on 3 times more to do than others. Fifteen minutes later Cory came out to tell us that the air conditioning looked like it seized up and was the cause. I suggested that has been like that for two years and had left it because we don’t use air anyway. Does the pulley spin? Tim would check. Yea it spins. Whew! The belt arrived from the parts store in town and a few minutes later Cory came out and said a pulley, bracket, and bolt had gone missing completely. Definitely the reason the belt failure. We had just replaced the altenator and might be the reason. They were heading to the parts store to get the part and we would be on the road in a half hour. Doing the math we were going to be cutting it close in Owatonna. We called Rob Stephens to inform him what was happening and said he would talk to the folks at the facility to hold it open longer and suggested if they allowed it he would wait inside until we arrived so we could get the alpacas into the facility for the night. Right after the call Cory came out with the parts man with some bad news. The parts store does not sell the part like the GM dealers in that a spacer that needs to be in the pulley that holds it together is sold separately and was not included with the part they bought. They would need to get the spacer in the morning because the part store was now closed, but they would have us on the road by 10am Friday. A couple of thoughts crossed my mind at this point a few I cannot repeat, maybe more like prayers seeing I was invoking his name. I pointed out to Cory that keeping the alpacas on the trailer overnight would not be the best and the reason we were on the road early was due to the weather that was rolling across the country. Cory paused and then suggested that they had a pickup with a crew cab if our things would fit in it but the box could not be used because it was for sale and they could not afford scratches. He said he would give us his home phone number to make arrangements to swap it out Sunday on our way through. I checked the luggage area and could see all our things could not fit and thanked him for the opportunity. We called Rob Stephens and said it did not look like we would make it that night. Rob didn’t flinch and said he was doing some work in the hotel room so just call if that changes. By the time that call was over Cory and the parts man were standing there with another option. The parts man had the same part in his vehicle and was willing to take it out and put this in our car to get us on the way with two provisions; first, we would pay for a new part for his car and second, the dealership would need to loan him a car for the weekend until he could get the part. I agreed to the first and suggested the dealership provision was in their hands. Cory came back in a few minutes and the dealership owner said what ever was needed to help us get underway. WOW! At 8:15pm Cory came over to tell us we are ready to go and to settle up with the charges and paused as he reviewed the bill pointing out that Ian from Rush Tow Service had given us a very very good rate and the dealership also helped. I thought salesmanship right but when he told us the charge and it was half what we expected – again WOW! We were back on the road at 8:30pm and Cory had checked travel time and weather for us to Owatonna and said about 2.5 hours in good weather but the front had moved in and was affecting the area west of Rochester. We called Rob to tell him we were going to be too late to get the alpacas into the facility and he informed us they were experiencing freezing rain in Owatonna right then so drive slow and he would help unload in the morning. Rain started just east of Rochester as I watched the temperature drop from 36 to 35 to 34 and finally settle around 31 degrees. We were watchful of ice starting to form but traction was good so far. We were about 5 miles west of Rochester when we could see a squad car coming with its lights on behind us and I was certain I had not been speeding but pulled over to see what I did wrong as not one but two squads sped past. Huh! We thought we will see them somewhere ahead and hoped not too bad an event. 10 miles further we topped a hill and could see the red and blue lights ahead. We approached cautiously seeing four squads and difficult to determine if they were in the road or the shoulder. Good thing too because this is where the road changed ice and slick. Two other drivers had not been as lucky with one pulled on the shoulder but the other upside down in the ditch. We said a silent prayer for them and thanks for providing us with the warning. The next 23 miles were the longest on the trip and took us 1.5 hours to get to our hotel. We pulled in at 12:15am parked, checked the alpacas and went to bed so that we could get them to the facility at 7:00am and off the trailer. Rob was waiting for us at 7:00am and we quickly setup the pens and got the alpacas off the trailer. Rob’s reaction summed it up – “They’re filthy!” We had to agree, their legs all the way to their bellies were spoiled with a mixture of feces and urine that was more slurry than beans. We hoped as they dried this would diminish but that would not be the case. We were embarrassed showing alpacas in this condition but Peter Kennedy always the gentleman looked past the mess and evaluated them fairly but could not withhold a humorous quip now and then about snow melt, bad spring, and pasture ready might mean something a bit more reserved. We all got good laughs out of this and helped us relax a bit. Many stated what bad luck as we related this story and we thought, bad luck? Things happen and parts wear out or go missing, that is life. Sometimes it happens in the middle of nowhere like this and that might be unlucky but again things happen. We saw the luck as good that we were lucky to have Ian respond from Rush Towing Service, Cory from the GM dealership who respond to do everything possible to get us underway in as timely fashion as we could, the GM dealership itself and commitment to service, the parts man who contributed personally to help us, a good friend in Rob Stephens who provided emotional and physical support, and the alpaca community who understood this was not the way we wanted to show alpacas but every once in awhile things happen and you just need to do what is necessary. Bad luck? Nope this was the luckiest day we have had in a long time. Marge only has one wish – can we move that dealership near home? Water, Water, Where did the Water go? OK, for you that have automatic water'rs this is the time to put your feet up on the desk, sit back, and have a good laugh or reflection on why you water the way you do. Last night temperatures reached zero. I was finishing chores as the sun set and was interested in finishing soon because the temperature was dropping rapidly and I was beginning to feel the sting. So I wrapped up and did not do my usual checklist just before heading in and apparently thought I would do it when I started today. The first thing I ran into were solid blocks of ice I used to call water buckets in the trailer behind the ATV. When I went to lift them nearly took my arm off. Ice is definitely heavier than water! Well this night started by taking the buckets into the basement, filling the washtub with hot water to start the thawing, and then the task of filling and emptying them until all the ice was gone. Then I got to change clothes before going back out for this nights chores because of the shower I had taken thawing buckets. It is amazing how early it gets dark these days and how upset the alpacas were for being a little tardy with their candy (supplement). Next time I won't be in such a hurry to get in and now I am looking for some ice to have a drink. Genetic gain passed to the young. When quality females are offered as “production” or “foundation” this seems to trigger a Typhoid Mary response. What no banners? 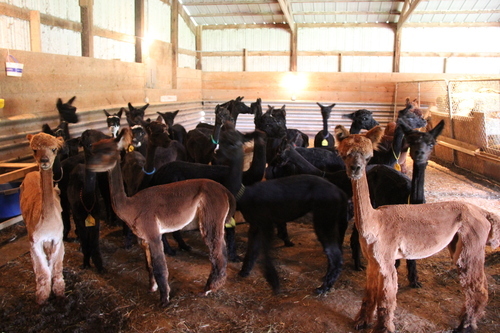 Selecting alpacas from show winners relies only on phenotype. You may say –no- they also have great pedigree! 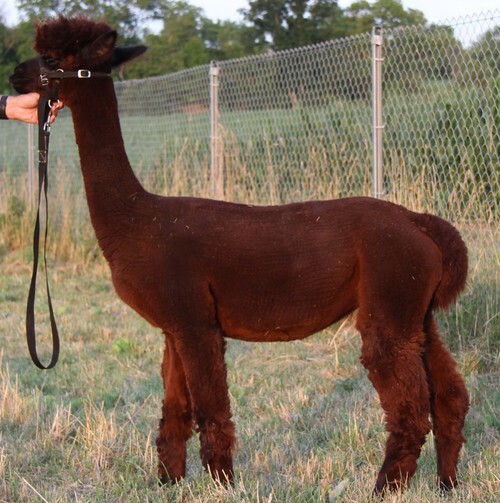 If your goal is developing a quality line of alpacas that produce consistently higher quality alpacas these are the three weakest criteria when selecting foundation females, show placement, phenotype, and pedigree. Let us share our experience to support this thinking. 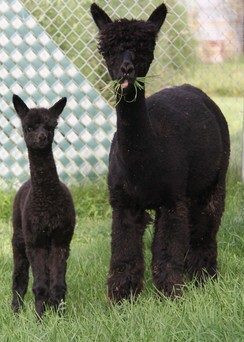 We develop a line of true black alpacas for the commercial fleece market. Our selection criteria are very critical to maintain this goal. 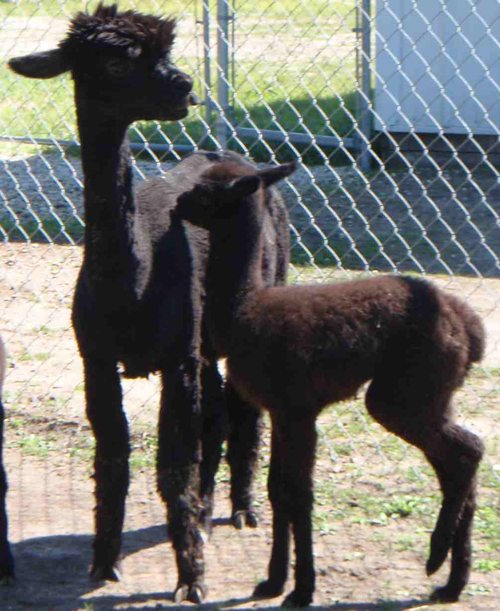 We show alpacas to compare our results with the top phenotype in the market. Why not say the top breeding pedigree in the country? 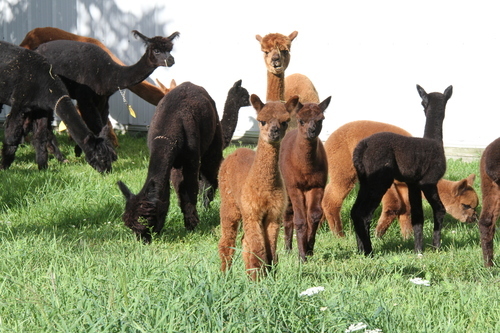 The reason is what we call “Breed for the Show” alpacas typical in the black huacaya classes. We see many breed black to white hoping for a black because that black may carry the phenotypic improvement from white and will excel against most blacks in the ring but production from this offspring may or may not be able to pass along the genetic gain. They are high quality phenotype with great pedigree and may win banners but have no prepotency. This provides a very expensive lesson that is very expensive to overcome. This brings us back to “foundation” or “production” dams. 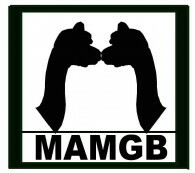 They may have won ribbons in the show, they definitely have fleece highly sought after by fiber mills, they have great pedigree, and they have one more thing – consistent, outstanding, improved cria that excel over their parents who in their own right carry forward the genetic gain on their own. That is prepotency. The dams available for sale on our web page are pre-potent and demonstrated their ability to pass along conformational sound, phenotypic improvement, and show winning quality with strong pedigree to support continued growth in all areas. They have demonstrated the ability to produce milk to bring rapid growth and robust cria with high vigor. 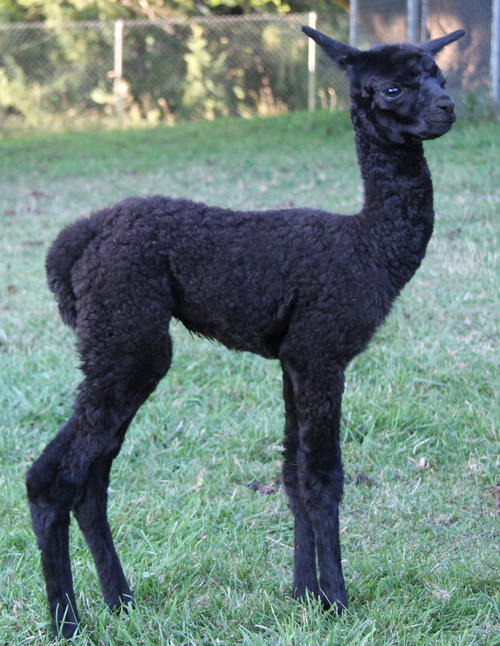 We are making them available to your breeding program because their offspring are now our next level of developing a black herd of alpacas. Not every plan works - where's the black!???? Dystocia defined in medical journals state, “abnormal labor or childbirth” or “a slow and difficult labor or delivery.” Dystocic births that result in a failed birth are costly in many respects. Potential need of a veterinary is a direct cost. Loss of 660 days of production and we arrive at this number due to waiting 2 years to see the next cria on the ground and the results of that breeding success toward genetic gain. We define success as not only a successful birth but the phenotypic gain anticipated or predicted in the breeding. This is the number one reason a production female is a high value commodity. Considering production females provide viewable results of prior births often referred to as pre-potency the single best way to determine potential or anticipated gain in breeding decisions. Pre-potency provides evidence of well-conformed birth defect free results. Yes the male contributes half the genetic gain or loss and his pre-potency is well founded through multiple offspring. This amount of reference certainly reduces his risk factor in breeding decisions and magnifies the lack of reference provided by the female meaning 50 percent from a risk standpoint is higher on the female side of the breeding decision. An experienced production female reduces risk in delivery having demonstrated ease in birth. 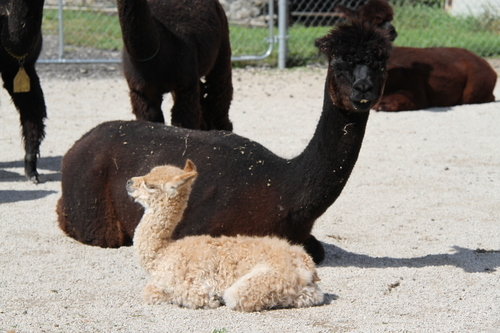 They have proven to be good mothers with good milk production and rapid weight gain in their cria. Production females reduce the risk in breeding decisions by pre-potency observation, when reviewed along with the pre-potency of the male. Reducing risk to high dollar breeding is a goal we practice toward herd genetic gain and experienced production females accomplish this for our breeding program as it will yours. Osiceca in front of others from production females. Wiyaka-reduced risk off farm breeding. Heyun Sapa - Reduced risk on farm breeding. 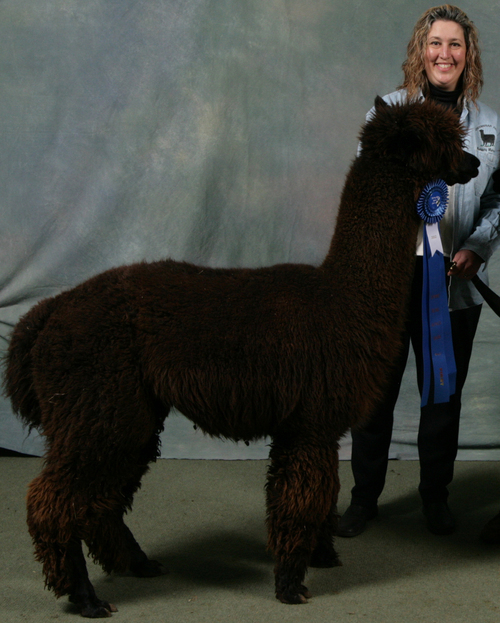 Marge and I entered three of our maidens in True Black Yearling Huacaya at the Illinois Alpaca Show in Grayslake October 26, 2013. We predicted the order if they did not walk was Suluta, BobbyJo, and Atungya. Suluta possesses the type of fleece the spinning mills seek where the primary and secondary fibers are nearly equal. BobbyJo has nice fleece with great conformation but shorter staple, and Atungya carries nice conformation but her primary fibers are a bit heavier than her secondary fibers. Well we definitely access fleece quality different than the show system. We finished second, third, and fourth in the class which was exciting, but the order was Atungya, BobbyJo, and Suluta. Well we got one right with BobbyJo in the middle - Right? Atungya was recognized to have white fibers as an observation but not deduction because color contamination is not a deduction in the show ring. She carried "excellent fineness, superb conformation with a soft hand." BobbyJo was "consistently black but not as uniform as those placing ahead in the class." Suluta "is well built with more capacity and true to type with fineness and very soft hand." 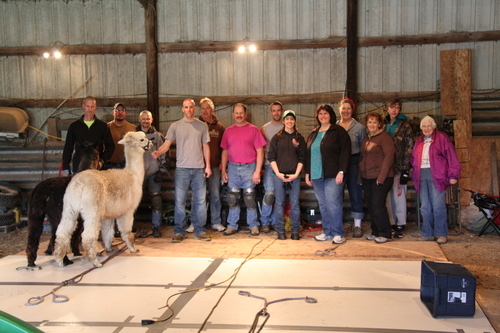 We attended the Michigan Alpaca Festival in Grand Rapids Michigan October, 2013. The judge’s recitations included “finest in the class but lacks the density…”, “best fleece in the class but would like to see a larger frame – but they are young and have growing to do”, but always “extremely nice hand.”. We hear “extremely nice hand” in recitations consistently from one judge to the next. In part “hand” is a result of uniformity measured by Standard Deviation in Watt (OFDA2000) or Yocom (OFDA100) histograms. Standard Deviation alone can be deceptive being a measurement from the mean of the AFD and if that AFD is 14-micron or 30-micron it will not matter stating only how closely related the population of fibers tested are to each other. We need to differentiate uniformity as measured by SD from consistency. Uniformity compares individual fiber-to-fiber and consistency recognizes the variation of the overall fleece from head to tail to toes. Consistency is assessed opening the fleece at various points observing variation from blanket to the bib and legs. So uniformity may help the “hand” but is a small part of the story, after all a 30-micron fleece that has an SD of 3.0 or a 14-micron fleece that has an SD of 8.0 does not have “nice hand”. Both these feel good in general but fail the “buttery” adjective often applied to fleece with a “nice hand”. Nice hand is a combination of four characteristics; fineness, uniformity, scale, and the closeness of primary to the secondary fiber diameter. One measurement that lends insight to how close the fibers are is Percent Over 30 on a histogram. Generally, primaries will be stronger and increase this percent however over time secondary fibers can contribute to this measurement. A magnifying glass assists differentiating primary from secondary fibers. Primary fibers in some alpacas stand out clearly. 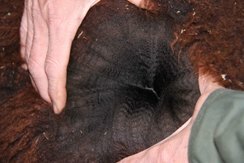 Alpacas with close diameters between primary and secondary fibers are difficult separating and are endemic to “nice hand”. Scale on fiber can contribute to “nice hand”. Scale can be observed under a microscope and is not something we have done the reason is that there is no measurement nor base of information to compare what we see. So we will let our hand do the selection and histograms to compare. Wasake contributes hand, consitency, fineness, density.